The sport of tennis involves strict attention to detail, applying predictive moves to counter the opponent, lateral movements, and good hand-eye coordination. The sport has evolved since the tracings of its early beginnings in the 12th century. During the sport's infancy, the game was played with hands instead of racquets. The racquet plays an essential role to conquering your game. Service speed generated from full body movement also traces to the tightness in the strings. Spin control that is normally generated at the wrist also works well with string coverage on the racquet, with particular pockets of support and reinforcement. Racquets do not come cheap, calling for the individual to learn how to string their tools. Below we will review some of the top tennis stringing machines available on the market. We will also detail the functions each device type possesses, assessing cost, time, and individual output numbers to help you decide which machine suits you best. Of the names producing tennis stringing machines, Gamma is one of the most recognizable. Their genius traces back over 25 years, making them one of the most trusted producers on the market today. The X-2 model features the classic drop weight format with pulley system. Built from all aluminum material, this machine is constructed to last. Designed with table top grippers to allow users to work from any flat surface they desire. These grippers will ensure a proper hold, reducing any shifts during the stringing process. The scale traces from 9 to 90-pound tension amounts, applying a range that suit your tension needs. The base of the machine also rotates 360 degrees, providing the function you need to get to even the toughest of stringing angles. This 2-piece system features bulky clamps that provide a strong hold, reducing the lean your racquet undergoes. This is one of the most affordable options extending from the most recognizable name in the tennis stringing game, making it a sound fit for the beginning user. Keeping with the drop weight format, we have the Klippermate stringing machine. Klippermate is relatively new to the racquet stringing space and their model takes slight changes to classical builds. The small change occurs at the clamps in the 2-piece holding function. Both clamps work from inside the racquet, which gives the user more room to work around. This helps create a space saving function that brings fluidity to the stringing process. The drop weight sits closer to the racquet with this model, allowing you to work more closely with the tensions, as opposed to having to extend your reach. This is important for an intensive process because it limits your movement to reduce fatigue. This model also comes with an applied gripping package, allowing you to find stability on rough surfacing. The clamps included are made purely of steel, holding up to the test of time. All the other elements are made from either steel or aluminum, proving to stand up to long-term usage. 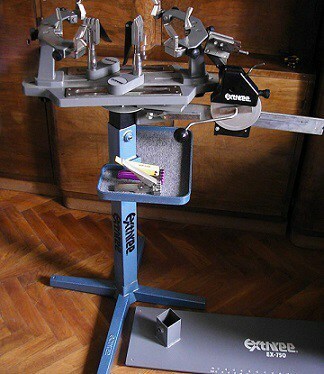 This complete system also includes any necessary tools you would need for holding or operating your stringing. Due to the close nature of the elements, this machine only requires about 30 minutes of fiddling to complete a string, which is far less than comparable drop weight models. The Gamma Progression model is an upgrade to their product line that features the crank methodology described previously. This model operates via a 6-piece clamp holding system, with 2 clamps extending from the bottom and the other 4 from the sides of the racquet face. These clamps are made of metal and are coated with a metallic seal, allowing them to stand up to the test of time. This model also features the signature 360-degree rotation at the base, allowing you to work seamlessly as you string your racquet. The clamps are also swiveled, allowing you to navigate in tight spaces when you near crossover points in your string. This device also includes also necessary tools you need to tighten or provide additional holding. The base is flat and includes grippers on the undercarriage. The crank method works to spool the string within the device and provide a tighter, more consistent hold for tension concerns. The under and side hold of the clamps allows the user to move around the device and use the overtop space for stringing, which is a prime area of use during the course of a string. The Gamma Progression II ELS is the electronic upgrade to the classical Gamma formatting. The electronic system comes equipped with 9 separate memory settings, allowing you to zero on precision with your stringing. These settings include weight distributions, pulling speeds, knot help, and pre-stretching amongst others. These mentionable features are done hands-free, which is a claim other non-electronic machines cannot claim. The knot help and pre-stretching capabilities reduce time spent untwirling troublesome string and can reduce snapping with pre-tension testing. The clamps also adjust to holding patterns on their own, reducing over tightening by hand. 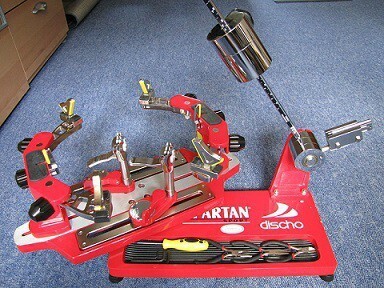 This machine operates with a 6-piece holding pattern, which increases the stability of the racquet during your work. The turntable rotates to 360 degrees, allowing you to reach the tough nooks and crannies with ease. Comes with a full line of tools needed and includes adjustables for the base, improving both grip and versatility on adverse surfacing. This machine is priced competitively for the electronic space, making it a fitting choice for the consumer who works with volume or needs a quick fix. The Gamma X-ES model is an electronic model that is a little more compact in styling than the model previously described. This electronic puller works on a constant basis, limiting re-stringing or having to apply force. This helps to tighten the tension and reduce slacking as you go about your stringing. Made from all aluminum components, this allows the machine to be both durable and lightweight. 6-piece clamp holding comes standard with these devices. These clamps allow for rotation about them, allowing you to reach trouble areas without having to loosen your racquet grip. Included in this model is a foot pedal switch, making it almost completely hands-free to operate. The LED display features little buttons that cater to the tightness of the tension in weight, allow for pre-stretching of the string, and knot control within. Add these features in with the included tool set for making adjustments and applying pressures gives you the complete package with this Gamma creation. The Tourna 300-CS is one of the first stand-alone stringing machines on the market. Operating via the crank system, this upright machine creates stability over various builds. The first is the platformed base that features metal legs that go side-by-side a flat plank. This helps extend beyond the width of the machine, reducing shaking and instability. The trunk of the machine extends upward, with a platform and string holder about halfway up. This trunk is than spaced evenly to the clamp contraption. The overall design suits users who have trouble locating a flat, table surface for their work. The pieces are also spread out, taking up a large amount of surface volume. With this in mind, it is important to know the dimensions before placing your order. The spacing allows for the user to focus on specific areas, without having to cram themselves into tight spaces or limiting movement by placing the elements close together. This is a complete build that helps save time and reduces personal fatigue during usage. The Prince NEOS 1000 is the second stand alone machine that we found. Comprised exclusively of aluminum and metal materials, everything from the clamps to the trunk of the tabled design is built to last. This stand-alone machine greets the ground via 4 extended legs. The trunk of the machine features a small platform that makes for a fitting space for tools and extra string. The trunk is also adjustable, extending to the desired height. This height adjustment piece is important due to the extensive work that stringing costs your body. This will reduce your amount of hunching in your back and will keep you operating in the correct upright position. This device is accomplished with the crank inclusion, which helps to tighten and hold the tension level for you. The tension can be adjusted via a small knob on the crank, reaching a maximum weight hold of 90 pounds. This total package comes with the necessary tools needed for operation, limiting the extra search and money spent on the needed tools. This item is priced relatively cheap for stand alone options, making it a great fit for a user who struggles with using the correct posture when working. After viewing this informational video, your knowledge of machine types has been expanded. We will now detail the specifics revolving around each machine, touching on points that the video left our or left little detail to. Out of the three options listed, the drop weight machine is the most cost effective. Simple models can be purchased relatively cheap and the mechanics of the machinery make for a used model an option for purchase. This machine relies heavily on the use of a pulley system to operate. There is a weight that is attached to a long metal rod. This weight slides from the top to the bottom of the rod to produce tension and a proper hold on your string. The tension, itself, is set by a small knob placed on the outer portion of the weight. This allows the user to set the proper tension they desire. When it comes to time savings, this is not the model to opt in for. Each time you line a string, you have to reset the calibration of the tension knob, which is not ideal for users who are looking to pump out volume. The consistency of these models is to par with the other mentions, marking it as a reliable option. 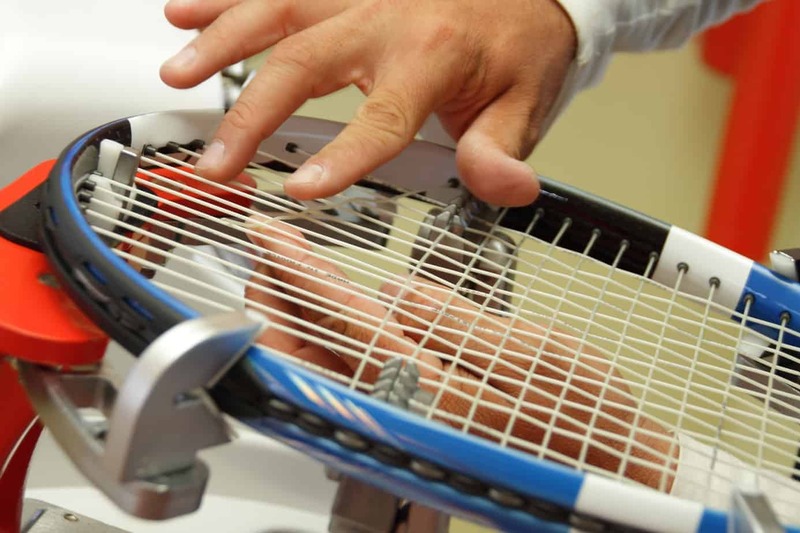 When it comes to racquet stability during the stringing process, there are two separate holding counts one can choose from. The 2-piece mount will keep the racquet help tight, but may cause for concern with leaning as you work towards the outside of the racquet. To limit this movement, the 6-piece mount will clamp the racquet from six separate angles. This allows you to work hands-free from the racquet, keeping you stable and level throughout the process. As mentioned previously, this option is the most cost effective. Most models will run about half the price of the crank machines and significantly less than electronic models. It will not produce volume, making it the perfect setup for the casual player. The second machine in our discussion utilizes a locking method to keep string tension. There is a spring that is housed within a small fixture. This fixture is set at a distance from the holding mounts. Since it is spring loaded, it will lock the string in place, allowing you to focus your attention on the proper stringing technique. This also limits the amount of personal adjustments that are to be made. It reduces the need to change the setting of the tension, with the spring keeping this setting in a constant hold for the user. Since this model requires the use of more complex mechanisms, it will run you slightly more than the drop weight models. Due to the machine not including any electronic parts, it will still be priced well below electronic counterparts. 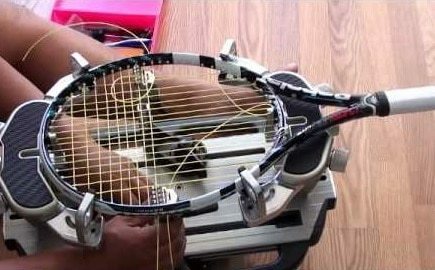 The time needed to string the racquet is also decreased due to the hands-free nature this machine affords the user in the tension category. 6-piece mounts are common in the crank machine space, so ensure you find a model that features these extra holding components. Lastly, we have the electronic pull machine. This machine features calibrated functions that are available to the user on a touchscreen or via a small input system. This system is usually installed in a small box and is usually displayed in an LED format. The precise nature of this machine allows the user to set the tension and the holds this box provides. This keeps the tension process completely hands-free for the user. The major draw of this system is its precise nature and the ability it has to string racquets quickly. Most will prescribe industrial use as the price tag often reaches far beyond the cost of the non-electronic counterparts. 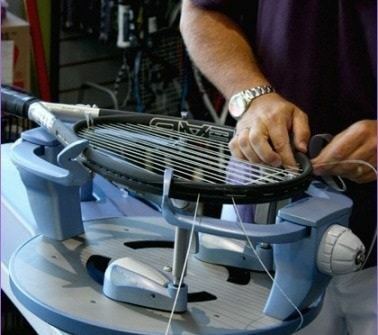 Due to the time you save on stringing, the user can often string a few different racquets with adverse tension holds. This is a great tool for being able to work on different components of individual game play. It allows the user to specify tension amounts for working on drop shots, applying spin to the ball, or getting the most velocity out of your serve. These precision models work best for those with a high-end budget. When it comes to applying the differing tension amounts, users have to cater to their style of play. Novice users are going to work on their volleying and worry less about applied techniques like spin and playing with gravity. They will want a simple fix for their racquet, making the drop weight model a good suggestion for beginners. It is also a perfect fit for those who like to get a little crafty. Setting aside enough time to accomplish this cumbersome process is a good starting point, as it is both repetitive and demands constant attention. If you are an avid player who wants to focus on refining your developed skills over stringing time, opt for the lockout or the electronic model. These models will allow you to create differing tension amounts in a quicker span of time. This gets you to the playing surface more quickly and will become less of a hassle should you find a loose string or your strings sitting in a slanted form. The self-stringing machine presents the best value because it helps to limit your time spent working and still allows for the novice user to participate. The drop weight machines are a close second due to cost, but value associates to ease of use more than it does monetary value. With this ranking system, you'll notice the value machines come in at the cheapest options. This is based off of the fact that most users of these machines are not leasing for industrial purposes and purchasing outright. If you are going to invest the few thousand dollars needed for the electronic machines, you might as well save your money through buying cheap racquets. The stand-alone machines run about half the price of the electronic counterparts, making them an intriguing option based off of health advantages. Again, the novice user benefits most from the learning process that comes with the cheaper machines in the drop weight and lockout options. After looking at the various contributors to the tennis stringing space, it is hard to ignore the output being brought forth by Gamma. Their name is posted across the tennis stringing marketplace and it is for good reason. They have consistently provided relevant solutions for all different skill types and workloads. They work to develop their machinery via sound methods that are all durable. It would be unfair to give one of their models an edge over the other, due to the differing needs of the consumer. If you are looking to add to your tennis stringing collection, look at the many product lines that Gamma has released. Each model contains small updates that make a huge difference for the consumer. Whether it be the introduction of a stand-alone model to help with fatigue concerns or intricate means to reduce the total demand needed from the user, Gamma gets it done.